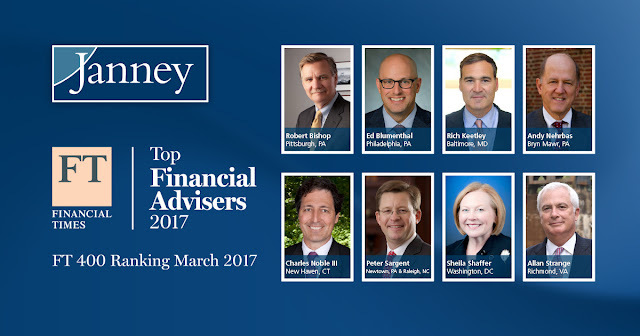 PHILADELPHIA, PA – March 30, 2017 – Janney Montgomery Scott LLC (“Janney”) today announced that eight of the firm’s Financial Advisors have been named to Financial Times’ 2017 list of “Top 400 Financial Advisors,” published March 30, 2017. The advisors named from Janney are: Robert Bishop, Executive Vice President, Pittsburgh, PA; Edward Blumenthal, Executive Vice President, Philadelphia, PA; Richard Keetley, Executive Vice President, Baltimore, MD; Andy Nerhbas, Executive Vice President, Bryn Mawr, PA; Charles Noble, Executive Vice President New Haven, CT; Peter Sargent, Executive Vice President, Raleigh, NC & Newtown, PA; Sheila Shaffer, Executive Vice President, Washington, DC; and Allan Strange, Executive Vice President, Richmond, VA. The Financial Times list is based on objective and quantitative criteria provided by financial services firms across the country. The calculation considers factors such as assets under management (AUM) growth rate, years of experience, regulatory record, industry certifications and online accessibility. Robert H. Bishop serves as Executive Vice President/Investments, founder, and senior member of the Bishop Wealth Management Group at Janney Montgomery Scott. Bob has been a Financial Advisor with Janney Montgomery Scott, formerly Parker/Hunter, since 1983 and was part of the team that created Janney Capital Management (formerly Parker/Hunter Asset Management) in 1993. He was previously named a Barron’s “Top Advisor” in 2016, was named a “FT 400 Top Financial Advisors” by Financial Times in 2013, and currently sits on Janney’s Financial Advisor Advisory Board. He has a graduate degree in Management from the University of Pittsburgh and has attended the University of Pennsylvania’s Wharton Business School’s Securities Industry Association (SIA) Institute. An active member of the community, Bob has served on a variety of boards including a public school board, Habitat for Humanity, the Coalition for Christian Outreach and the Janney Board of Managers. Ed Blumenthal serves as Executive Vice President/Wealth Management and a senior partner of Stedmark Partners at Janney Montgomery Scott. An Accredited Wealth Management Advisorsm, Blumenthal was previously named a Barron’s “Top Advisor” from 2013 through 2017. He was also was named in the “FT 400 Top Financial Advisors” by Financial Times in 2013, 2014, 2016, and 2017. Blumenthal is a board member and serves on the Executive Committee of the Eastern Pennsylvania/Delaware Regional Chapter of the Anti-Defamation League, and will Chair the ADL’s 2017 “WALK Against Hate”. He is an active member of the National Multiple Sclerosis Society, Greater Delaware Valley Chapter’s Planning Team for the MS City toShore Bike Tour. Blumenthal received his undergraduate degree in economics from the University of Rochester. Rich serves as Executive Vice President/Wealth Management of Scheinker Investment Partners of Janney Montgomery Scott. He is a Certified Financial Planner™ (CFP®) and a Certified Investment Management AnalystSM (CIMA®). Since joining Janney, Rich has been named as one of 2 Advisors on Janney’s Wealth Management Mutual Fund Investment Committee. Rich began his career in 1992 at Legg Mason where he was Director Investment Management Services and focused on Financial Planning and Professional money management for high net worth clients of the firm. Rich received his Bachelor of Arts in Social and Behavioral Sciences from Johns Hopkins University. He is a member of The Investment Management Consultants Association and is a former Board Member with St. Ambrose Housing and Aid Center where he has served on the charities board and finance committees. Andrew R. Nehrbas serves as Executive Vice President/ Wealth Management of Nehrbas Wealth Management of Janney Montgomery Scott. In 2016 and 2015 Financial Times named Andy to the “FT 400 Top Financial Advisors.” In 2008 and 2009 Andy was named one of the top fifteen financial advisors by the Philadelphia Business Journal. Also in 2009, Andy was named one of the “Top 1000 Advisors” by Barron’s. Additionally, the January 2012 issue of Main Line Today Magazine, Andy was named as one of the “Top Financial Advisors on the Main Line” and in May 2012, the team was featured in Suburban Life Magazine. Andy is a graduate of Franklin and Marshall College. He is an avid squash player, having recently won the 50’s National Amateur Championship in men’s doubles. A former President of the Merion Cricket Club, Andy is actively involved with SquashSmarts, Inc., and Presbyterian Children’s Village. In his free time, Andy enjoys racquet sports, fly fishing, biking and skiing with his wife and their four children. Charles J. Noble, III serves as Executive Vice President/ Wealth Management of Noble Wealth Advisors of Janney Montgomery Scott, and Branch Manager of the firm’s Downtown New Haven, Connecticut office. He currently is a member of Janney’s Board of Managers, serves on the Board of Directors of Ecochlor, Inc. and serves as Chairman of the Board of Managers of Kathie’s Kitchen-SuperSeedz. He was named a Barron’s Top Advisor from 2014 through 2016, named in the “FT 400 Top Financial Advisors” by Financial Times in 2013 and 2014, and was awarded Janney’s 2012 Financial Advisor of the Year. Noble received his BS in Finance from the University of New Haven and completed the SIA Course of Study at the Wharton School of Business. Peter Sargent is an Executive Vice President/Wealth Management and the founder of Sargent Wealth Management of Janney Montgomery Scott, with offices in Raleigh, NC and Yardley, PA. Peter holds both the CFA designation and CFP® certificate, a designation awarded by the Certified Financial Planner Board of Standards, Inc. Peter was featured in On Wall Street magazine’s “Top 40 Advisors Under 40” and was previously selected as a Barron’s “Top Advisor” in 2009, 2010, 2012, and 2017. He is a member of the New York Society of Security Analysts, a member of the University of Delaware Financial Planning and Wealth Management Advisory Board and was a former Board Member of the Alumni Association at the University of Delaware’s Business School. Sheila is the leader of Shaffer Wealth Advisory Group, a multi-generational team, at Janney Montgomery Scott in Washington, D.C. As a Certified Financial Planner CFP®, Sheila and her team provide personalized comprehensive wealth management and customized portfolio solutions for affluent clients. The team is responsible for managing $500 million in client assets for individuals, small businesses, and multi-generational families. Additionally in 2017, Sheila has been named to Forbes’ list of “America’s Top Women Advisors,” and recognized as Janney’s Financial Advisor of the Year. She has previously been named by Financial Times as a “FT 400 Top Financial Advisors” by Financial Times in 2014 and 2015 and, in 2014, as one of their “Top 100 Women Advisors”. Sheila has served, and continues to serve, on a variety of boards including the National Museum of Women in the Arts (NMWA), Janney’s Financial Advisory Council, and the Janney Board of Managers. Sheila is a member of the DC Chapter of the International Women’s Forum. Sheila is a dedicated member of the Washington, D.C. and Shepherdstown, W.V. communities that she shares with her husband and three Havanese dogs. Sheila supports the Race for the Cure, DC Special Olympics, and the Contemporary American Theater Festival in Shepherdstown WV. Sheila enjoys the performing arts, is an eager traveler, and an avid reader. Allan Strange, Executive Vice President/Wealth Management, leads the Strange Group at Janney Montgomery Scott, and has been advising clients on their investments for more than 30 years. He is consistently ranked by Barron’s as a “Top Advisor,” previously being named in 2009, from 2011 through 2017, and was named as a Financial Times “Top 401 Retirement Plan Advisor” in 2015 and 2016. Allan was named as Janney’s Financial Advisor of the year in 2015, has been a member of Janney’s premier CEO Roundtable since joining the firm in 2009, and has earned the Accredited Investment Fiduciary® designation from Fiduciary 360. An avid golfer, Strange played professionally for three years after graduating from East Tennessee State University. Janney provides advice to individual, corporate and institutional clients. Our expertise includes guidance about asset management, corporate and public finance, equity and fixed income investing, equity research, institutional equity and fixed income sales and trading, investment strategy, financial planning, mergers and acquisitions, public and private capital raising, portfolio management, retirement and income planning, and wealth management. Janney is an independently-operated subsidiary of The Penn Mutual Life Insurance Company and is a member of the Financial Industry Regulatory Authority (FINRA) and Securities Investor Protection Corporation (SIPC). Additional company information is available at www.janney.com and on Twitter @Janney1832.